(Nanowerk News) Approximately 25% of a tree is lignin – a biopolymer that glues the cellulose fibres together to form strong and durable wood. 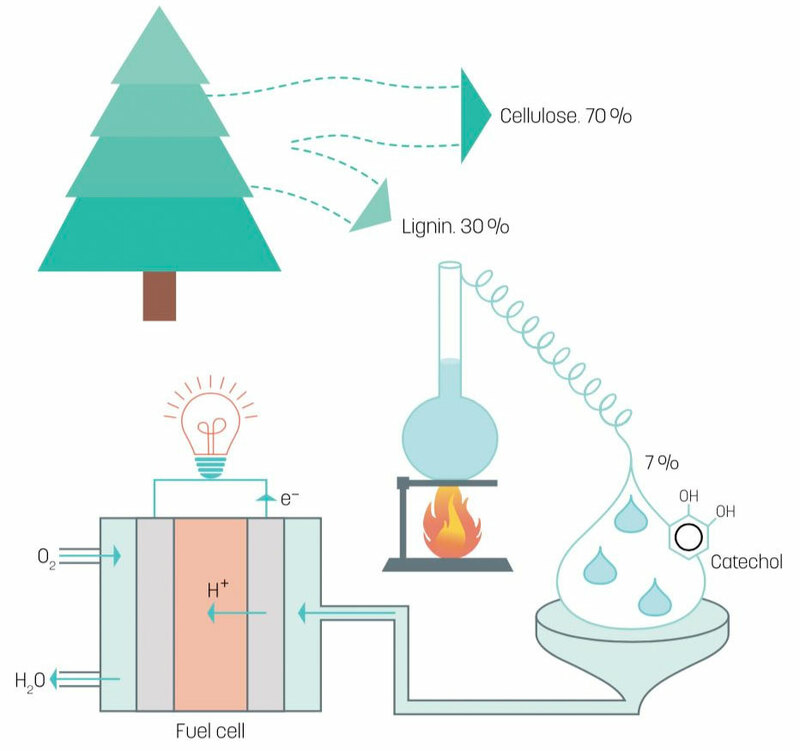 During the chemical manufacture of paper pulp this lignin is dissolved in either the sulphate or sulphite process, since the cellulose is the desired component for making paper. Lignin is cheap and readily available. It is a biopolymer that consists of a large number of hydrocarbon chains woven together, which can be broken down in an industrial process to its energy-rich constituent parts, benzenediols. One of these, catechol makes up 7% of lignin. 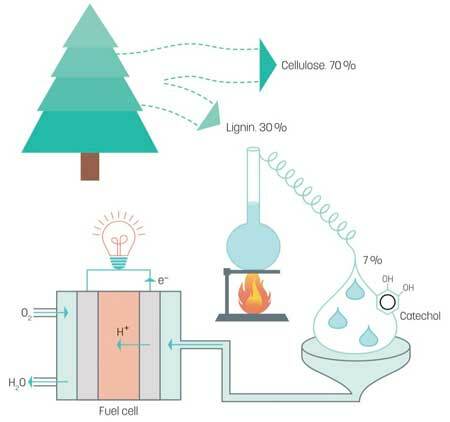 Researchers at the Organic Energy Materials group at LiU, led by Professor Xavier Crispin, have discovered that this type of molecule is an excellent fuel for use in fuel cells (Advanced Sustainable Systems, "Conducting Polymer Electrocatalysts for Proton-Coupled Electron Transfer Reactions: Toward Organic Fuel Cells with Forest Fuels"). The fuel most often used in tradition fuel cells is hydrogen gas, which reacts with oxygen from the air. The chemical energy is converted in the fuel cell to electricity, water and heat. However, 96% of the hydrogen produced worldwide is from non-sustainable sources, and is accompanied by carbon dioxide emission. Other fuels used in fuel cells are ethanol and methanol, but these produce also carbon dioxide as a by-product. The electrodes necessary to attract the fleeing electrons are usually made from platinum, which is both expensive and scarce. Benzenediols, however, are aromatic molecules, and metal electrodes cannot be used in fuel cells based on benzenediols since the reactions are slightly more complex. The researchers instead use electrodes made from the popular conducting polymer PEDOT:PSS. This polymer has the interesting property of conducting electricity, while at the same time having a surplus of protons. This means that it functions as both electrode and proton conductor. The chemical energy of the fuel is converted to electricity without carbon dioxide being formed. “When a fuel such as ethanol is used in a fuel cell, people usually claim that it has zero impact on the climate, since the carbon dioxide is a component of a circulation. This means that ethanol is considered to be a green fuel. We can now manufacture electricity without any emission of carbon dioxide at all, which makes our fuel supergreen. The technology also both cheap and scalable,” says Xavier Crispin. Only a few research groups have investigated PEDOT:PSS as a possible material for both electrodes and catalyst. “There is a fundamental lack of knowledge about PEDOT:PSS within electrochemistry,” concludes Xavier Crispin, as he proudly introduces doctoral student Canyan Che and principal research engineer Mikhail Vagin, who make up the group that has worked with the fuel cell. The researchers have calculated that the amount of electricity produced by the new fuel cell is approximately the same as the current ethanol-based and methanol-based fuel cells. It remains to improve and optimise the function.